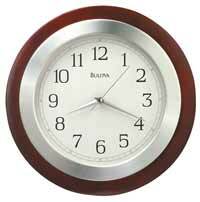 The Bulova C4256 Espresso Wall Clock features a solid hardwood case with a dark contemporary Espresso finish. 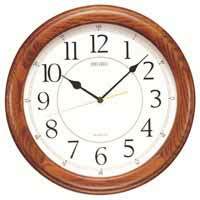 The solid wood frame has decorative vertical cuts to create a modern, segmented look. There is a raised, antique silver bezel (ring) around the dial to hold the glass securely and create a visual break between the dial and the frame. 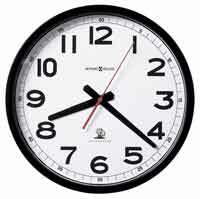 A soft white dial is printed with traditional black numerals and spaded hands for easy viewing. A protective glass crystal covers the dial. 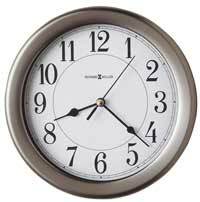 The combination of the silver-tone second hand and bezel adds contemporary elements to the design of this clock. Operates on One “AA” Battery. Accurate, Quiet Sweep movement allows the second hand to move in a continuous motion without any "stepping"" and eliminates any ticking. 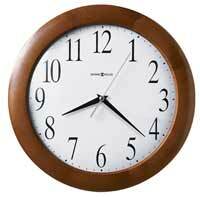 Clocks for sale at The Clock Depot including the C4256 at discount prices.